“Run, hide in the closet.” Little eyes fill with tears and arms stretch out. The teacher gives the children tootsie roll candies and whispers for them to be quiet. A fifth-grade boy starts to pray. The children all hold hands as the teacher hugs them. They huddle in the closet in the music room and wait. . .
That day, these children were all safe, thanks to the brave teachers and administrators who quickly instituted a lock down, the resilient children who stayed calm, and the fast-acting police force. For this, I will always be grateful, as this was the scene described to me by daughter, now fourteen, about events that happened to her when she was ten. I write, in part, because it helps me make sense of a world where alternative facts have become our reality. However, there are no alternative facts for the events that took place this week in Parkland, Florida: an 18-year-old with an assault rifle and 17 innocent lives lost. Can we make sense of this? Never. Unfortunately, we have seen this cycle play out politically before—each side pointing a finger at the other. It’s the guns, says the left. It’s mental health, says the right. Neither allegation is sufficient, in and of itself. If there were one singular answer, we as a society would have fixed it, because there are good and caring people across the political spectrum. In 1999, the Institute of Medicine famously examined preventable medical errors and determined that most medical errors resulted from faulty systems, processes, and conditions—in other words, multiple system failures. In Parkland, the multiple system failures include, but are not limited to, relatively easy access to guns–the sale and distribution of semi-automatic and automatic guns (and armor piercing ammunition); our demonstrated inability to effectively enforce existing gun laws and regulations; ineffective identification of, treatment, and reimbursement for mental health conditions; and inadequate funding of health care, schools, social services, family services, and law enforcement. These multiple, complex system failures have also been present in other mass shooting cases. In fact, these system failures have led, in part, to the American Medical Association labeling gun violence as a public health crisis. In the United States, there are approximately 270 million guns–two times more than any other country, including Yemen, the number two gun-owning country in the world. Yes, our Second Amendment gives citizens the right to bear arms. But it is now a common occurrence to find out after the fact, that the killer—often a teenager or someone with a criminal record, mental illness, or hate in his or her heart—easily acquired assault weapons or a cache of weapons and ammunition. We need to accept that something needs to change. If we want to solve the problem, we must reverse the effects of the Dickey Amendment’s “ban” on using federal funds to support gun violence research, implement tighter gun control laws, and provide the necessary resources to recognize and affirm community concerns to trigger law enforcement alert and notification, and enforce gun-related laws. We simply have to do better. Focusing solely on guns, however, is insufficient. The gun lobby is famous for saying “Guns don’t kill people, people kill people.” If we take this premise as true, then let’s start valuing (paying for) social support systems that will help “people (not) kill people.” Consider, for example, mental health. There is a lack of resources from the research phase, through identification, treatment, and reimbursement for mental health conditions. Yet, we need more than mental health assessments for adults; we need to fund every aspect of our schools from the earliest stages of preschool into high school and beyond, to the physical school campuses, to providing adequate salaries and resources for teachers, administrators, social workers, counselors and SRO’s. We need to conduct research to determine what types of discipline makes sense for students. We need to provide alternatives for students who learn differently or exhibit behavioral issues. Furthermore, we need to assess funding for federal, state, and local law enforcement so that they have the resources necessary to function effectively. What can’t continue is the status quo by asking all of the social systems in this country to do more for less and then blame them when the systems fail. Behavioral economists tell us that we make decisions—about funding and otherwise—on that which we value. If we value human lives over gun ownership, then we will need to address both gun control and the multiple failures in our social fabric. Reconstructing the social safety net won’t be easy, and it will be expensive. There will be significant ideological resistance to this idea, as critics will argue that, as Americans, we have been born and bred to be independent. But, maybe cooler heads will prevail if we can meet in the middle, recognizing that we need to be both independent and interdependent–that we need each other and that we, as a society, need stronger, functional social support systems. That, instead of blaming and ending the inquiry in a standoff, we should dig deeper to identify all the root causes and come up with workable solutions on all fronts. We are the society that has put a man on the moon. We mapped the human genome. Surely, we can solve this problem—or at least make more progress than we have to date by simply blaming others and defending our competing positions. Our children deserve better. Professor Coughlin is a multiple-award winning teacher, recognized for both her teaching and scholarship. She is the recipient of the the 2017 Mary S. Lawrence Award from the Legal Writing Institute, the Wake Forest University Teaching and Learning Center’s Teaching Innovation Award, the Joseph Branch Award for Excellence in Teaching and a multi-year recipient of the Graham Award for Excellence in Teaching Legal Research and Writing. 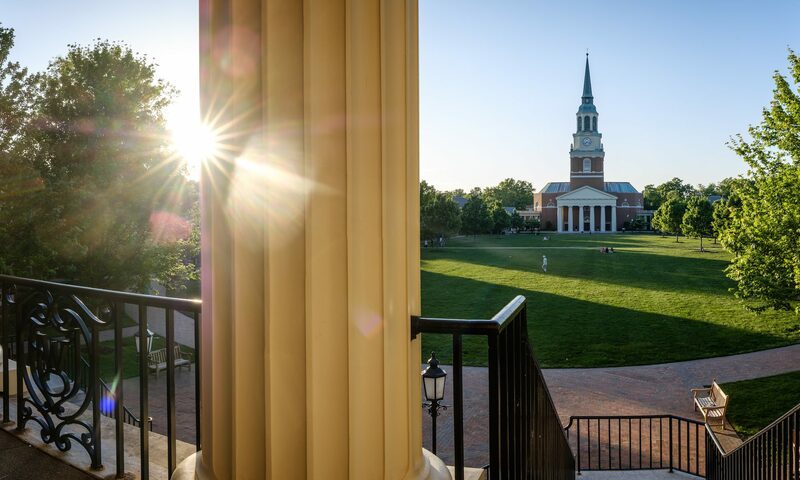 Professor Coughlin also has appointments in the Wake Forest University Graduate School of Arts and Sciences, and the Wake Forest School of Medicine’s Translational Science Institute. She is a core faculty member in the Wake Forest University Center for Bioethics, Health & Science.